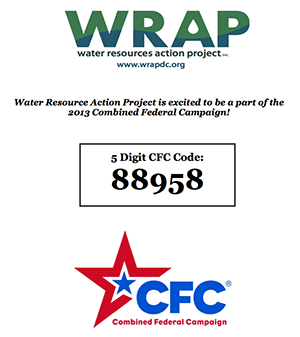 The Water Resources Action Project (WRAP) is pleased to be a part of the Combined Federal Campaign of the National Capital Area (CFCNCA) this holiday season. The campaign, which runs until January 15, 2014, offers federal employees an opportunity to donate to eligible non-profit organizations that provide health and human service benefits throughout the world. WRAP is listed this year for the first time among the eligible non-profit organizations, and federal employees can now direct their gifts to WRAP using WRAP’s unique code: 88958. WRAP has completed three rain harvesting installations and parallel education projects, impacting hundreds of school children in the Middle East, helping them to conserve water, improve sanitation, and educate students and communities on water conservation and environmental stewardship. As always, every penny of every dollar WRAP receives goes directly to its projects. WRAP’s next project, for which it is currently raising funds, will be a dual installation of rain barrel systems at Ort Holon, a Jewish coed school, and Ort Lod, an Arab coed school, both located in Israel’s Dan Region. 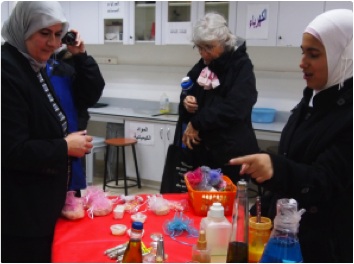 The educational curriculum will be implemented by the Arava Institute’s Youth Environmental Education Peace Initiative (YEEPI). By sharing and engaging with one another on the experience of rainwater harvesting and environmental conservation, WRAP and YEEPI hope to connect students from varying cultures, backgrounds, and beliefs to collaboratively address environmental issues, while breaking down communication barriers.